Postales Hotel Boutique offers the peace and serenity, typical of any countryside hotel that follows the seasons activities. It has 37 acres of vineyards, traditional crops and our own vegetable garden that you can explore and feel connected with nature. 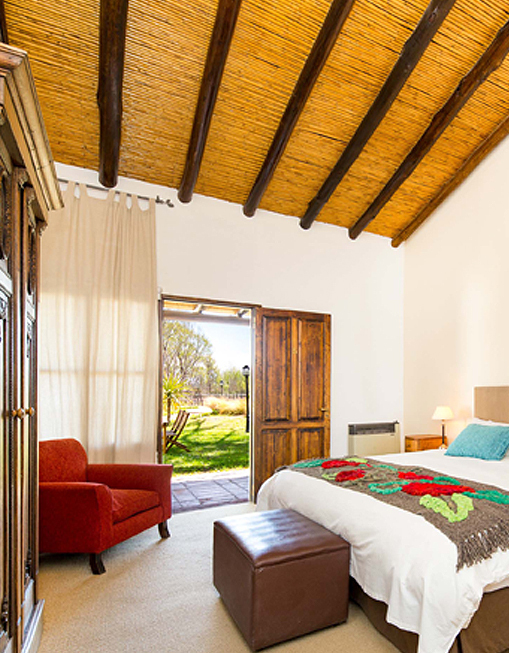 It has the warmth of the big farmhouses of Mendoza, reflected by their high cane ceilings, their private galleries and their integration with the surroundings. It has the charm of a home decorated with past findings and contemporary details, having the modern life comfort at the same time. It brings the magic of awakening the senses and makes visitors enjoy the little things in life, including best wine tasting, exquisite flavors from the Resto, cooking classes, tours around the property, aromatherapy, dolce far niente in the pool, and a Valley exploration. Free WIFI access in the entire hotel and its rooms. Our rooms open onto the gardens, the vineyards, and the relaxing area and swimming pool, with an amazing view of the Andes mountain. They are spacious (4m x 5m) and have high cane ceilings and a traditional gallery. They also have a unique atmosphere with antique furniture and contemporary design art, exclusive beds, large bathrooms (2m x 5m) with amenities. Free WIFI access, TV (in some rooms), table, chairs, heating and air conditioning system, safe-deposit box.